Demon Knights #0 – In this “Before the New 52” issue, we get a look at Jason and Etrigan before they were merged. We see Etrigan’s attempt to rise to power and Jason’s desire to find a meaning to his life and some adventure. It’s interesting to see how things come together to form the Demon that we know now. Green Hornet #28 – This issue starts a new story arc. There’s a couple things going on. The original Kato headed off to Iowa to meet a woman from his past and meet someone who may be his son. (He’s a chubby blonde who is “an embarrassment to people who play video games” as Kato puts it.) He starts to train the kid as the whole crew (Britt, Mulan, Clutch, and “Moonbeam”) show up. Meanwhile, a new set of characters are introduced as a bald man, his wife, and their son make their way to Century City, killing along the way. Green Lantern Corps #0 – Even though the book is about the corps, this issue is all about Guy Gardner. We see his interaction with his family and how he was before he got his ring. While the story starts with him as a recruit in the middle of a big battle, it jumps to a flashback and we get to see him save his brother and get his ring. We then ump back and see Kilowog give him his emblem and see Guy choose his own costume, and then meet Hal for the first time. It’s a good story. Harbinger #4 – We start out with Faith, the chubby girl introduced before. She gets brought to the Harbinger facility so that Peter can try to bring her powers out. He’s not able to do it and tells them to send her home. Meanwhile, Peter is haunted by images of Joe and Kris. He wants to find them and is assisted in escaping which allows him to find that the Harbinger group may have killed his friend. Things are about to get real messy here. He-Man and the Masters of the Universe #2 – We start out finding out that Adam is Skeletor’s nephew. (Huh?) Skeletor also seems to be in charge of Castle Greyskull. Adam gets captured by Trapjaw but rescued by Teela who also seems to have amnesia. There are so many questions and they seem to be taking their time answering them. It’s interesting but I sorta miss the regular stuff going on. Legion Lost #0 – Despite everything seeming to have not changed with the Legion, we’ve got an all new origin for Timber Wolf. It starts out with him as a kid and his parents getting killed, moved to him as a vigilante called Lone Wolf, and eventually calling himself Timber Wolf. He doesn’t actually join the Legion in the issue though. The Ravagers #0 – This issue shows more about the early days of Terra and Beast Boy after they were captured by Harvest. We see Gar get changed into Beast Boy. He is connected to the Red (like Animal Man) which is probably why they went to the new color. He also mentions Rita so it makes me wonder if we’ll see the Doom Patrol. We’ve seen Niles already after all. We’re left with the pair prior to the Teen Titan’s arrival. Resurrection Man #0 – This is a 0 issue but also the last issue. It’s also the secret of Mitch’s origin. It turns out the Mitch we’ve been following actually came from the discarded arm the original Mitch lost that was destroyed and reconstituted itself due to the nanites. Kinda weird explanation. The angels and demons return for their bounty and take the soul of the original Mitch instead. That means our Mitch is still around and may still show up somewhere. Scarlet Spider #9 – Kaine and the Rangers finish their team up as they take down Mammon and Roxxon. Kaine is getting to hate Peter more and more for setting the bar that is making him become a hero. Shade #12 – It’s not a 0 issue but it is the origin of the Shade… finally. After all the time in Starman, it’s good to see something of his origin. It’s possible it could even fit the whole pre-52 history. The only questionable part of Simon Culp’s part in the Shade’s origin (as well as his own). The Shade is a great character and it’s good to dig into the history. Team 7 #0 – This book takes place 5 years ago and involved the members of Team 7 getting pulled together. It’s interesting that the team s actually comprised of characters with their own modern day stories which sort of limits the book unless the characters are replaced. 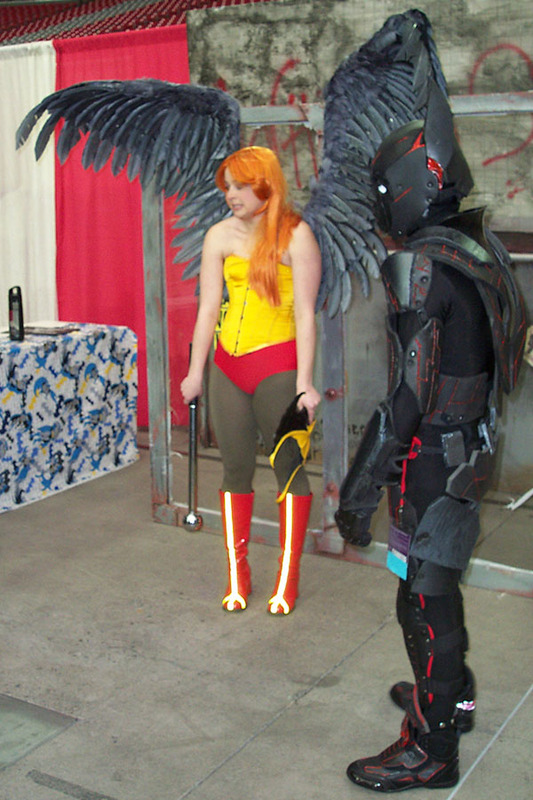 We have the early days of Black Canary (Dinah Drake for now), Grifter, and Deathstroke. The other recognizable characters are Lynch (who narrates), Kurt Lance (who I guess is this universe’s version of Larry, the husband of the original Black Canary), Alex Fairchild (Caitlin’s father), and Amanda Waller. There are more but I don’t recognize the names right now. They are brought together to take care of all the super powered beings that were popping up. Now sure if they will stay in the past or what. X-O Manowar #5 – Aric is finally coming to accept he’s in the future. The Vine (the alien race) send a team of humans (and the alien Dorian) out to get the armor but Aric takes them down without breaking a sweat. Since that didn’t work, they hire Ninjak to take him down which ihe is able to do with ease. It didn’t help that the armor was off of Aric and in ball form at the time. I’ve been trying to give this another try since I like the other book but this one doesn’t have the draw of the other titles so far. Maybe it’s the lack of interesting action, just being sudden and quick big battles. There were a number of interesting books but not all of them exceptional. I think my top 3 this week are Demon Knights, Green Lantern Corps, and Shade.